I was going to ignore the brouhaha over the antics of soon-to-step-down Toronto mayor Rob Ford. Politicians, after all, are generally a venal, amoral, childish, and destructive lot. Ridiculous behavior is to be expected among the species and is generally under-reported when specimens serve the moneyed interests that use the State to their own ends. An old blog post at LRC, however, points out what probably should have been obvious to me: Ford has been attacked by the press not for infantile behavior (for virtually all politicians behave badly upon close inspection) but because he has redeeming qualities that his rivals lack. Ford, for all his faults, sees himself as truly a "public servant" and has actually lowered government waste and made himself available to his citizenry. These are rare and admirable traits in a politician -- and they put a target on one's back. Libertarian: Pallas at the MC quincunx Sun and Mercury. Authoritarian: no discernible factors, unless we count the "squine" from Jupiter to Pallas, but even in this case Jupiter is conjunct the energy-draining South Node. Capitalist: no factors here, but Pallas is very strong. Collectivist: Venus at the Ascendant opposite the midpoint of Neptune and the South Node. This is a powerful-looking configuration but again, Pallas is so strong on this chart that Ford might be pulled towards capitalism anyway. The configuration might account for his drug problem, however. Conservative: no discernible factors (maybe a weak Moon/North-Node quincunx). Liberal: Moon at the Descendant conjunct the midpoint of Neptune and the South Node. Astrologically speaking, Ford isn't a "conservative" but a libertarian. Many libertarians side and/or identify with the political Right (Clint Eastwood comes to mind). 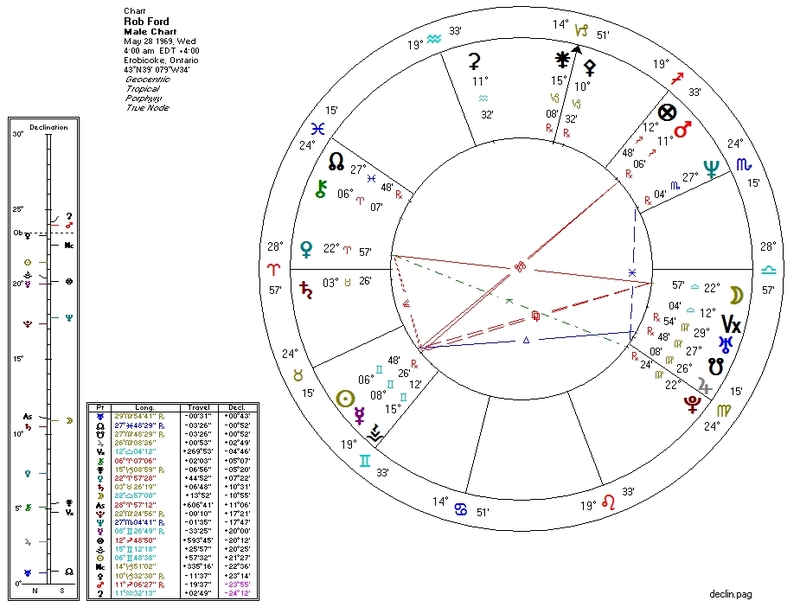 If Pallas were weaker on this chart, Ford would be an open leftist, because his astro-psychology certainly lives on the Left (as does mine). He even has an aspect-triangle between Pluto, Venus, and the Moon: suggestive of feminist leanings. Best of luck to Ford, with whatever he chooses to do after his term. And to Toronto, which will likely see a more typical "big spender" politician at the helm after Ford leaves.